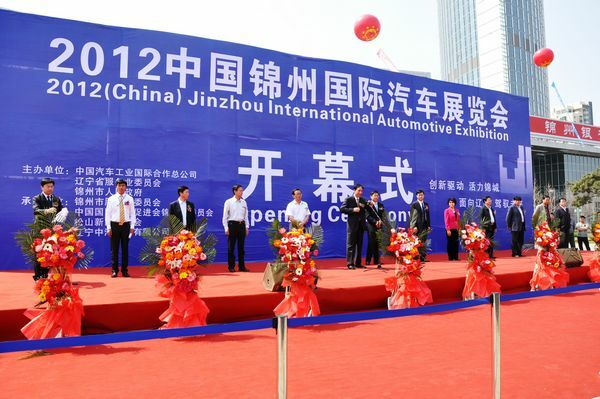 From 10th to 14th May, ‘2012 China Jinzhou International Auto Show’ were successfully held in Jinzhou International Convention & Exhibition Center. As a great automotive event in West Liaoning province, the 1st Jinzhou International Auto Show has a total exhibition area of 30,000 sqm, over 40 whole-vehicle exhibitors, 30 brands, and 200 displaying auto models, and over 10 million visitors. During the 5 days, 401 cars were sold on site, and 980 orders were made, nearly 200 million turnovers were made. Around 200 journalists from over 10 media reported the show. With the theme ‘innovation drive, dynamic Jinzhou city, from west Liaoning, to a better future’, 2012 China Jinzhou International Auto Show mainly exhibit imported auto brands. Focus on promote local auto market and its culture, increase the influence of Jinzhou city, the show has made a historical breakthrough in its scale, show effect, and cultural connotation. Follow the guide of Jinzhou Municipal People's Government’s policy ‘the development of exhibition industry is an important way to accelerate economic growth.’ With CNAICO’s superiority in auto exposition field, Jinzhou IAS gained great support from exhibitors. They provide the show most popular brands in the market: In imported luxury car pavilion, Bentley was showed in Jinzhou IAS for the first time, SGM had 1000 sqm exhibition area, and over 30 brand such as Buick, Cadillac, Chevrolet, Benz, BMW, Lincoln, Subaru, Opel, Hyundai, Kia, Ford, Ssang Yong, Beijing Hyundai, Emgrand, Baojun, FAW Mazda, FAW pentium, Dongfeng Fengxing, Dongfeng Yueda Kia, Skoda, Shanghai Volkswagen, Chery, King Long, Isuzu etc all joint the show. Make it a splendid visual impact for the visitors. With all sorts of incentive provided, exhibitors also consider the show as one of the largest sales platform of the year. 2012 China Jinzhou International Auto Show has set a new record in auto exhibition field with its scale, effect, and public concern in Liaoning Province. Experts evaluate the show as a ‘wind vane’ in Liaoning auto market. The show was co-organized by CNAICO, Liaoning service industry committee, Jinzhou Municipal People's Government, CCPIT Jinzhou, Songshan New Area Administrative Committee, and China National Automobile Convention and Exhibition Liaoning Co Ltd.
Vice president of CNAICO, Mr. Zhao Haiming and relative leaders of Jinzhou Municipal People's Government attend the opening ceremony, and visited the show site.